imWALL Multitouch is the realization of a new multitouch experience based on the latest technology in the field of interactive projections. 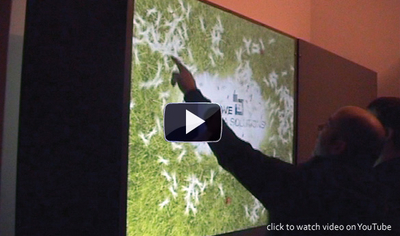 With the use of a Kinect-Sensor, every single pixel of the projection surface can be captured and becomes interactive. Multiple fingers can be identified, allowing multiple persons to interact at the same time. Size and form of the projection can be adjusted easily. You can define active and inactive areas individually and also use all functions of an ordinary multitouch device, like Drag & Drop, Zoom, Rotation etc. The imWALL technology is not only designed for both front and rear projections. Through the use of ultra-short-throw projectors, different module constructions can be offered. The application areas involve visual effects, as well as exciting multi-player games or complex infotainment systems for events, trade fairs or the point of sale.